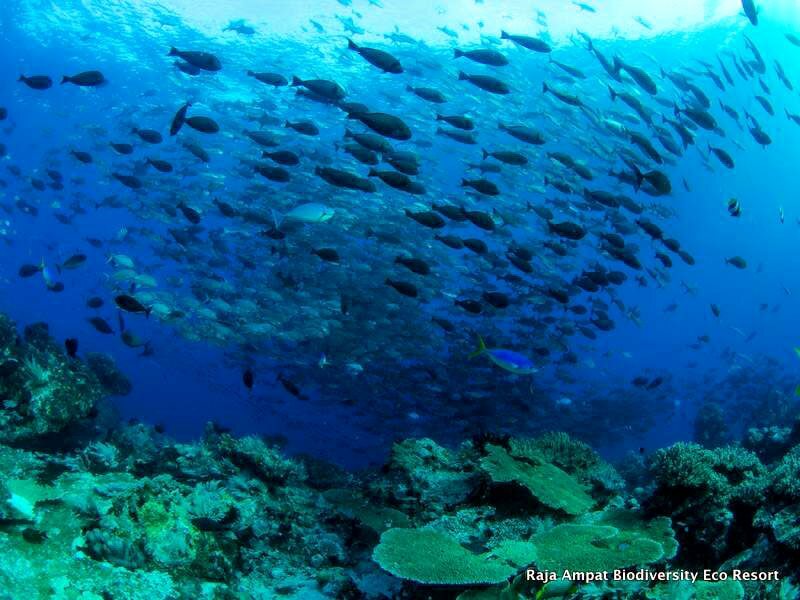 Raja Ampat Biodiversity is located in the Dampier Strait, with most of the famous dive sites just 5 to 15 minutes away. 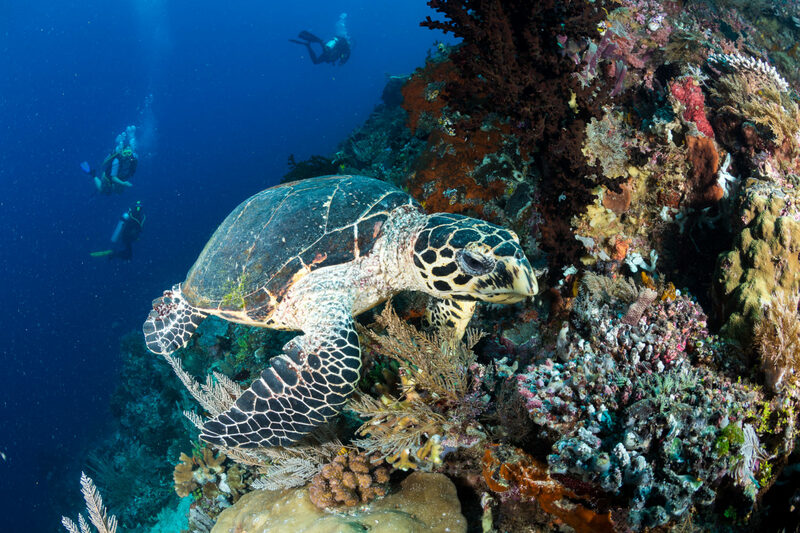 Our diving packages include dive sites within 12K radius from Biodiversity Resort. For more distant dive sites we charge a fuel supplement. We offer individual raja ampat diving experiences in small groups (a maximum of 6 or less, normally 4, per guide) and we aim to give you the best quality, safety and fun! 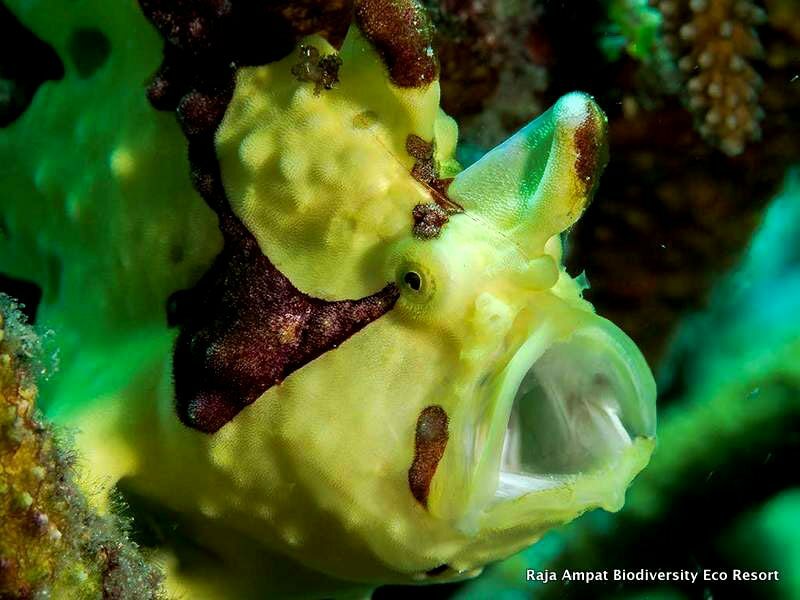 We are sure you will enjoy diving in Raja Ampat! Just as we prefer for our own dives, we offer long bottom times! Maximum of 75 minutes (if your air permits)! We organize the dive planning in collaboration with all our guests, to ensure that your Raja Ampat experience is complete and is everything you expected. We are very privileged to have such a wonderful house reef. Of course this is not the best Raja Ampat dive site, but we are sure you will enjoy it. It’s a gentle sloping fringe reef system and provides wonderful snorkeling and great dives. There is a wide diversity of soft and hard corals and some wonderful table corals in the shallows. Nights dives are very popular on the house reef with good chances of seeing the Epilate, walking shark, bobtail squid, ornate ghost pipe fish and so much more. Under the jetty there are a large number of fish including a large school of juvenile and adult bat fish. With its Indonesian name meaning “Five Rocks,” this is a perennial favorite, with many of our guests requesting one or more returns to this site. Descending on the north-eastern side takes you down to the maximum depth of around 24m. While following this slope you will be amazed at the scores of Fusiliers, Triggerfish, Unicorn Fish and Black Tip Reef Sharks frequenting this astonishing site. As you ascend at the end of your dive, you may encounter countless hunting Trevallies in the shallows, as we take you through the canyons that separate these rocks, always keeping an eye open for the multitude of Nudibranches and Flatworms that make their home among the vast array of colorful coral on the sides of these rocks. An ever-changing dive, where nothing can be predicted! Named after a houseguest at Biodiversity Resort who explored this area, this dive site has plenty to offer. Descending onto a shallow rock, your dive starts immediately with the welcoming site of colorful Anthias and Fusiliers. While swimming around this rock, keep an eye peeled for the exquisite Ghost Pipefish. After taking your time looking around, you can follow the natural slope down to your maximum depth, where you might encounter Blue Spotted Stingrays and even the elusive Pygmy Seahorse. On your way back to shallower depths, make sure to poke your head under some of the overhangs, to spot some Wobbegong Sharks. 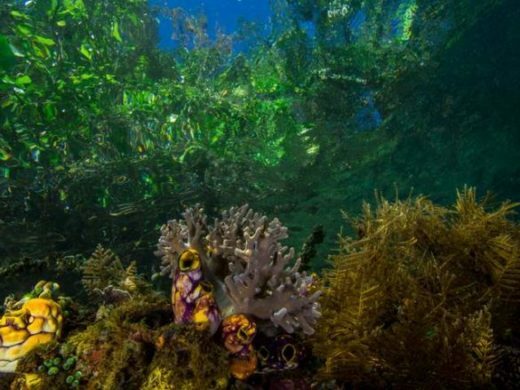 This site it less well known and it offers you the opportunity to dive in one of the most stunning Raja Ampat dive sites! Friwin Island actually has a few dive sites, with our favorites being Friwin Garden and Friwin Wall. 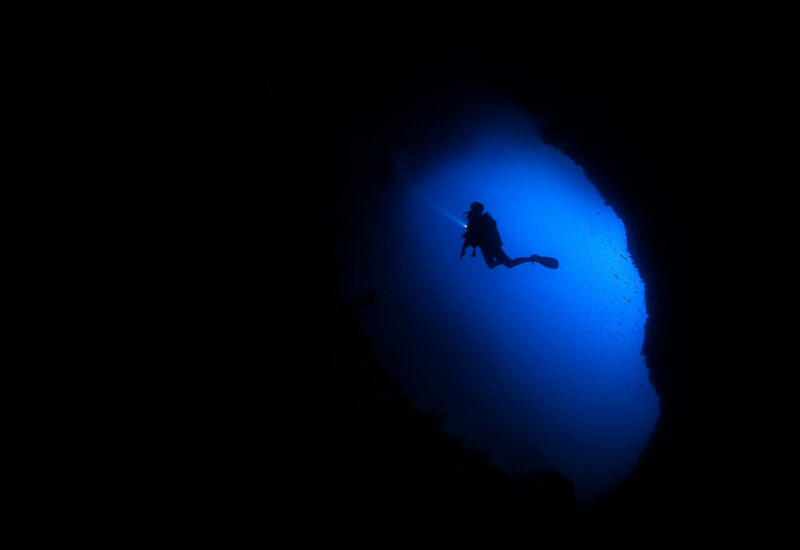 Do them as two separate dives, or combine the best of both worlds and do parts of each in one dive. Whichever way you choose to do it, be prepared to be astonished at Mother Nature’s knack for gardening. Hard corals of all colors, types and sizes are so thickly packed together that you will find it hard to find any clear opening exposing the bedrock. And this stretches for as far as the eye can see! Darting amongst these underwater sculptures are countless colorful Anthias, Wrasses, Fusiliers and Triggerfish, making it look like an aquarium in Wonderland. The garden eventually makes way to the side of Friwin Island – or Friwin Wall. Look for the countless Giant Gorgian Seafans growing on the side of the wall, along with numerous shrimps, crabs and Nudibranchs that call the seasquirts peppering the wall their home. As always, keep an eye towards the blue, as you never know what might show up! Starting this relaxing dive should be done on the current side of the island, leaving a good distance between entry point and the best point of dive site on the southeastern side. After you have marveled at the sheer number of Yellowtail and Blue Lined Snappers, you can lazily drift around the eastern side of the island, until you reach the “lee”. 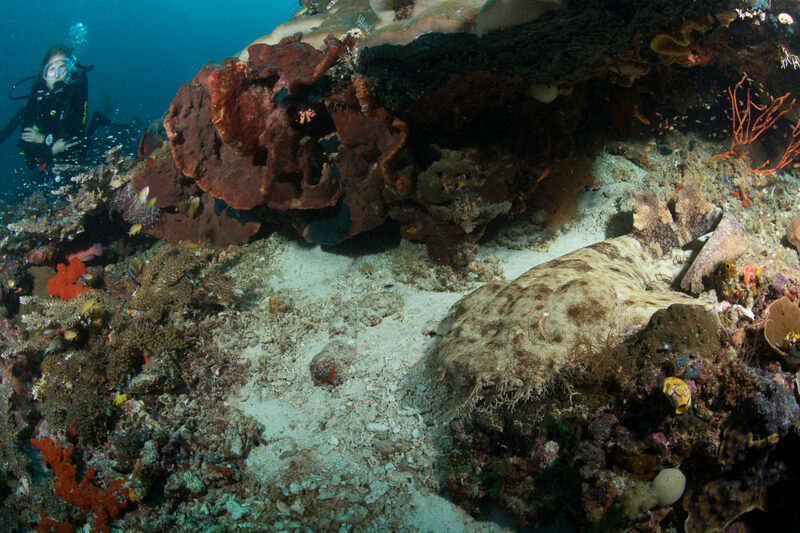 This site is well known as a likely opportunity to see Wobbegong Sharks. So make sure to peer under the coral ledges for these strange creatures, while also looking for tiny Pontohi Pygmy Seahorses on the coral rocks. Since it looks like a Japanese warship from the air, the US Air Force repeatedly bombed the island during WWII. In the intervening years the reef has recovered remarkably, with the chunks of rocks being blown off, creating magnificent crevices and overhangs, for an array of macro subjects. Ascending on a great wall, there is usually a group of sweetlips smiling at the cameras. Since it sits almost smack in the middle of the Dampier Strait, one regularly spots hunting Spanish Mackerel, or cruising White Tip Reef and Black Tip Reef Sharks. As you spend the latter half of the dive in the shallows, be on the lookout for Wobbegong and Epaulette Sharks, Turtles, and even sea snakes. This is another premier dive site, not to be missed! An oval shaped reef patch, it sits right in the middle of some open ocean. 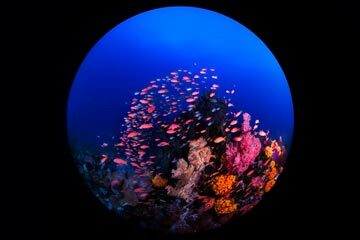 Around the reef, you will be astounded by the sheer number of Fusiliers, Surgeonfish, Snappers, Damselfish and butterflyfish. 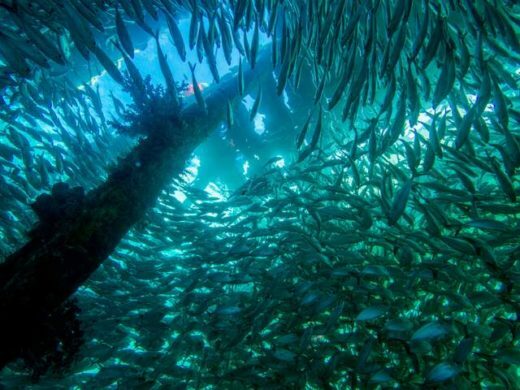 All this living food attracts predators, such as Barracuda, Spanish Mackerel, Giant Trevallies and several types of Jacks. On occasion you might even find some Grey Reef Sharks cruising around. This is also a great site to spot some less common species, like Oceanic Triggerfish, Bumphead Parrotfish, and Napolean Wrasse. Yet another great dive site! Perhaps the most famous of all the dive sites in Raja Ampat, due to the record-breaking 283 species (and growing) recorded in a single dive! The steep slope has absolutely everything on display – from vast gardens of colorful hard and soft corals, to the scintillating prospect of a Manta Ray flying by. The coral fields play host to an accent of color, provided by swarms of Fusiliers, Damsels, Surgeons and Anthias. Dogtooth Tuna, Barracuda, Mackerel, Trevallies, as well as Grey Reef, Blacktip Reef and White Tip Reef Sharks are frequently seen patrolling the area. You might also be surprised by Bumphead Parrots, Napoleon Wrasse and some very big groupers. This site is every bit the sensory overload, that will continue to mesmerize you, even after multiple dives. Sitting in the middle of the “blue” ocean, the ever present anticipation of what is just beyond sight makes this site truly “magical”. 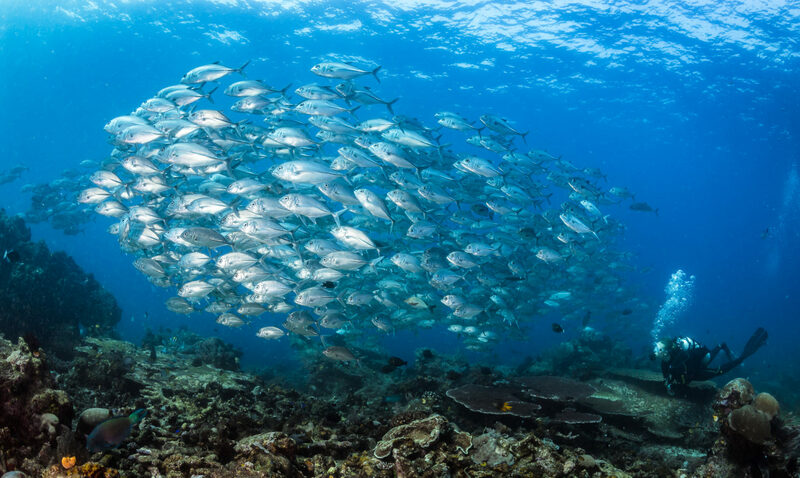 Great schools of fish swarm around the mostly hard corals, relentlessly pursued by swarms of Spanish Mackerel, Giant Trevally, Barracuda, Dogtooth Tuna, Rainbow Runners, and countless Jacks. More often than not, divers are surprised by Blacktip Reef and Grey Reef Sharks, Bumphead Parrots and even huge oceanic Mantas. This is the one site where anything can happen….and it usually does! Be ready for an amazing dive here! 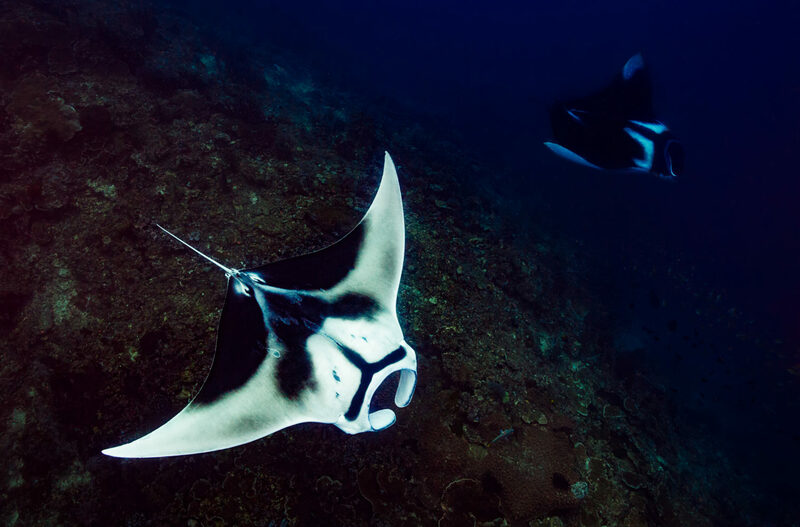 Between the months of October and April, great numbers of Manta Rays congregate in the shallow, plankton rich waters around Biodiversity, to feed. At this dive site you will have the opportunity to see these graceful beauties pause for a while to get groomed and cleaned. On a good day it might seem like the runway of a busy airport, as up to 20 Mantas have been spotted. Be aware that Mantas love current, and the stronger the better! At Biodiversity we strictly adhere to waiting behind a defined line of coral rubble, so as not to disturb these gentle giants. This is, without a doubt, one of the most memorable Raja Ampat dive sites. If you come in high season, please don’t miss it! Another shallow reef patch that, even with similar topography to other sites, delivers a vastly different set of species to look for. 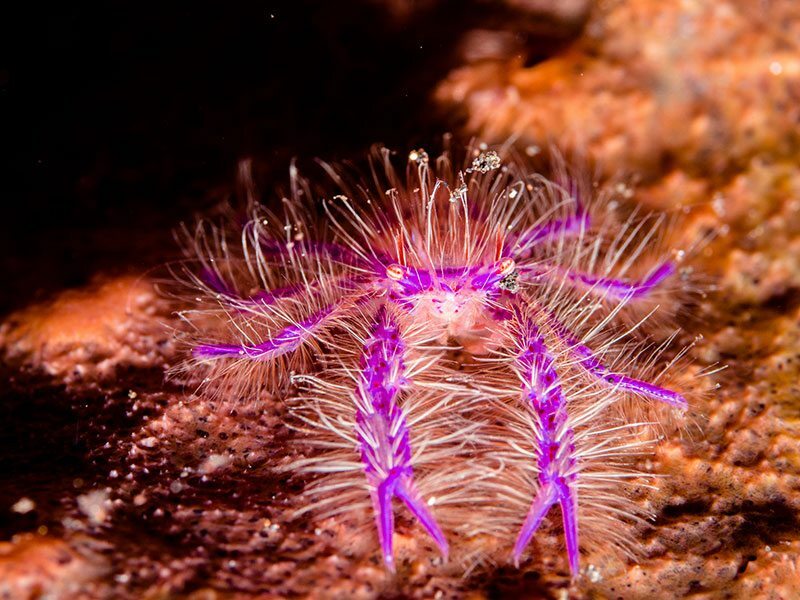 Everpresent is large numbers of fusiliers and other colorful fish inhabiting the coral, but also keep an eye open for pipefish, pigmy seahorses, nudibranches, flatworms and some very interesting crabs and shrimps. You might also be rewarded with a sighting of Crocodilefish and Wobbegong Sharks. The narrow gap between Waigeo and Gam Islands offer a true spectacle that has to be seen to be believed! Reaching the narrowest point of only 20m, this is where ocean meets jungle. As divers we are treated to the best of both worlds, as we explore just beneath the surface, among mangrove roots, for an array of colorful nudibranches, flatworms and other fascinating invertebrates. There are as many ways to dive this area as there are entry points. You can fly in the ever present current, looking for Bumphead Parrots, Barracuda, Turtles and even the odd shark or two, or you can seek shelter in the many bays, looking for dwarf cuttlefish, stonefish and the ever dancing juvenile Baramundi. Also present are light-filled caverns where Razorfish and Archerfish will obstruct your view of the lush green jungle just above the surface. Our version of “muck diving” will not disappoint! Sitting just inside the entrance of what is known as the lake between Waigo and Gam Islands, the small island of Urai has a wonderful reef system surrounding it. With dense hard corals in the shallows and a gentle slope it provides a chance to see Frog Fish and several different pipe fish species and a wide verity of macro life. Kabui is a delightful secluded beach with a sandy bottom and reef patches scattered about. It provides calm and current free training conditions for courses or refreshers, or a gentle bimble around its hard a soft coral bombies. With chances of Turtles and blue spotted reys there is always plenty of marine life. Andreas point is a beautiful reef full of color and diverse life from macro to schooling fish this site is best experienced shallow in the 5-15 meter range, this dive site is can only be dived around high tide due to its shallow nature, it makes for a wonderful afternoon life with plenty of color and lots of blenny’s and nudibranch, a very enjoyable dive and usually has no current, if there is then it is a gentle drift with the current no effort required. Ot Di Ma – Where’s My guide? 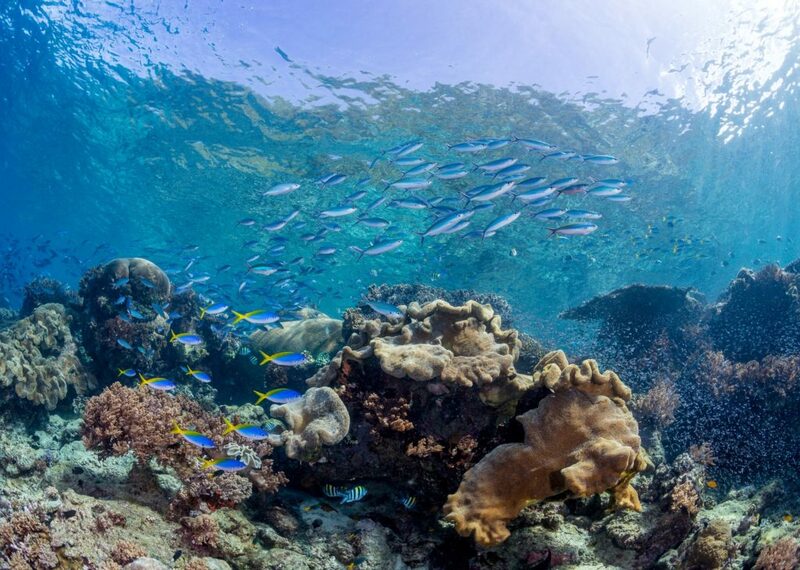 This is a dynamic and fun divesite aptly named because you can get good current on this site, it is more of an atoll so the currents can be multiple, coming from different directions as a result there is lots of schooling fish, turtles and sharks the corals are diverse and pristine ecosystem. Currents are dependent on tidal movements so are unpredictable and can change; due to this we recommend you hold advanced or a minimum of 15-20 dives to dive this site. Koh island is a beautiful sloping reef dive with a lot of interesting critters from the peacock mantis shrimp to lobsters lots of hard corals of every species, as it sits just off cape kri there is a good chance of big schools of fish without all the current associated with kri , very enjoyable dive for all. Just around the corner from yenbuba is; West Mansuar its a challenging and deeper dive, but the rewards are justified, most of the dive is done between 25 and 18 meters (the deep part) so we must watch our bottom time closely. 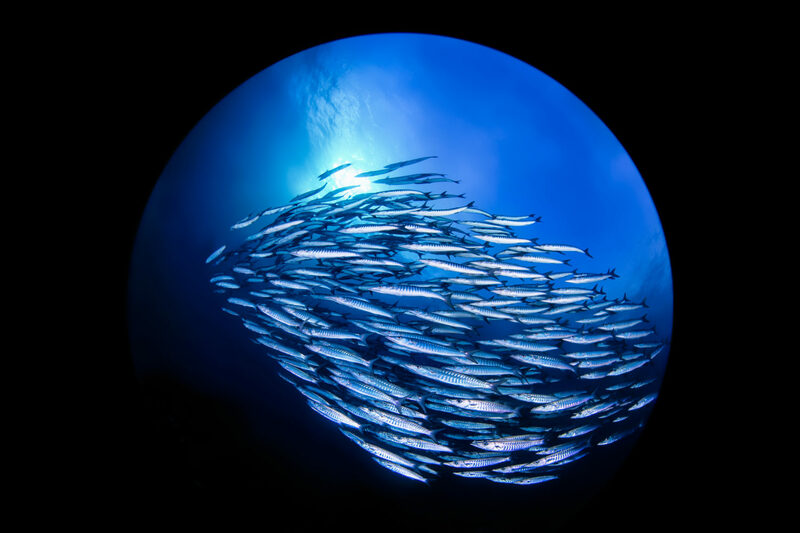 The marine life is abundant with larger schools of fish, barracuda, sharks and sweetlips to name a few (the current part). 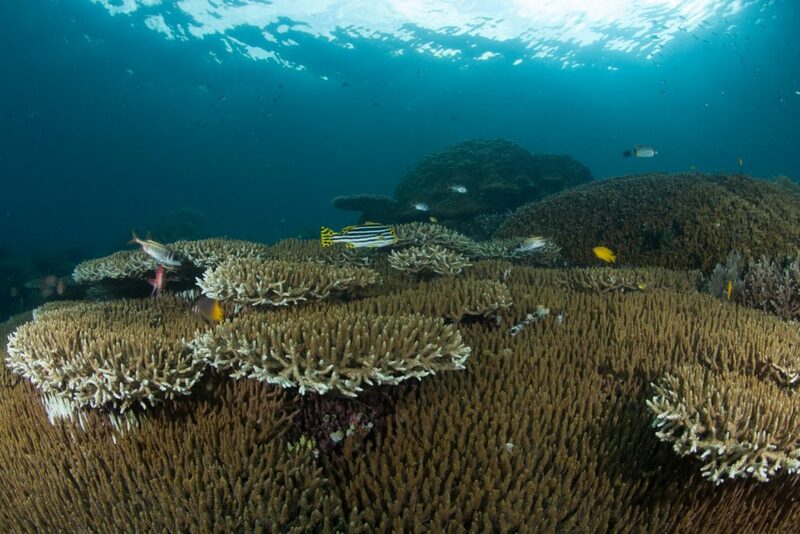 The corals are also very healthy and range from soft to hard corals with fish cleaning stations along the way. Due to the difficulty of this dive we recommend divers have advanced open water and at least 30 dives with experience in currents. This is a challenging dive and not for the faint heart it is subject to strong currents but a photographers dream , there are thousands of fish under the jetty and schooling jacks all hunting on the smaller silversides it is not an easy dive due to the currents but for those with experience its a spectacular one, There is also an area that has giant clams the size of table tops, they don’t come much bigger than here. Due to the difficulty of this dive we recommend divers have advanced open water and at least 30 dives with experience in currents. 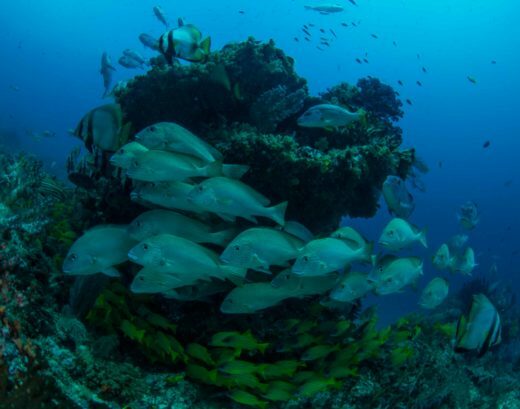 Yenbuba is a spectacular dive site with many different species of fish and a great chance for turtle enthusiasts to get up close to these wonderful creatures. It also has schooling giant barracuda on the point, which can have currents build up one. It is home to fields of amazing staghorn and cabbage corals as far as the eye can see. This dive is protected so it is great for beginners and those who have not been diving in a few years if there is currents, they go from left to right or vice versa so it is a gentle drift with the current. Ransiwor is another top dive and often has the bump head parrotfish schooling which is an impressive species of parrotfish due to their size. It’ss also a great location for cuttlefish and various species of pipefish including the ornate ghost pipefish, it is a sloping reef with several big cleaning stations so there is always interesting marine life hanging around including giant sweetlips, like yenbuba this is a gentle drift dive if there is any current present. This is a fantastic dive for the more seasoned diver due to the currents unpredictability and its habit of changing direction during the dive, often medium to strong currents , the reef slopes down to 30 M , majority of the dive is around 25-18 so computers must be monitored , with the currents it attracts the big marine life , lots of sharks, schooling Jacks, barracudas , and into the blue the chance of tuna. Due to the difficulty of this dive we recommend divers have advanced open water and at least 30 dives with experience in currents. These wonderful karst island formations are two hours away from the Biodiversity Resort. We organize a day-trip excursion, including two dives, first one in Fam Slope and second one in the famous Melissa´s Garden. A pic-nic (prepared by our staff) and viewpoint photos. Leaving the Resort at 8.00 coming back around 17.00. Available from October to April, in keeping with the Manta season. Is one hour away from the Biodiversity Resort. Manta Rays come to this cleaning station year after year to get groomed, offering breath- taking moments. 45 minutes away from the Biodiversity Resort. This is a river-like channel separating Waigeo Island and Gam Island. Price: 15USD pp min 4 pax. We hope this has given you an idea about the main Raja Ampat dive sites. If you have any further questions regarding these dive sites, please, don’t hesitate to contact us. These sites together offer you a perfect combination of big and small marine life. 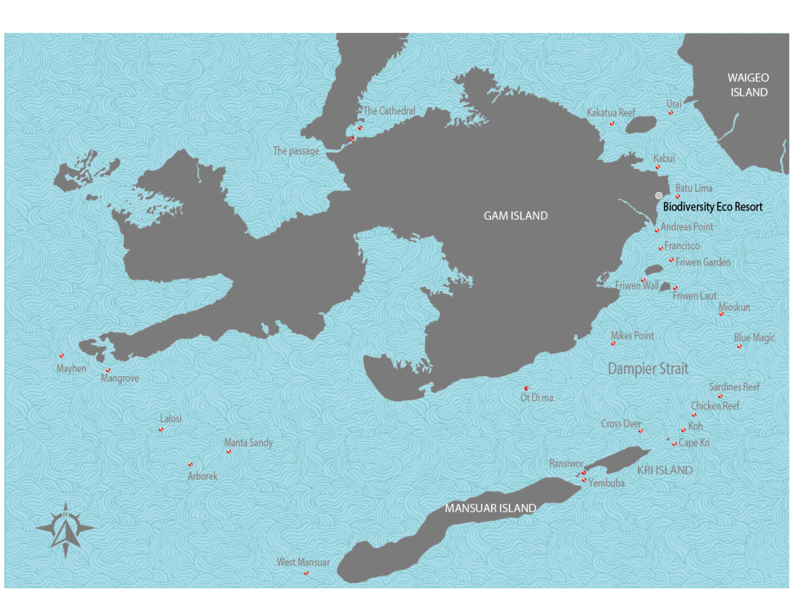 More distant dive sites can also be visited upon request. We charge an extra fuel supplement for these more distant sites. In the Western region of Walgeo you find Sel Pele Bay, the best area in Raja Ampat for glimpsing unique species. The bay has a wide mouth and a small island in the center. It also has an interior bay with pearl farms, but to visit them you have to request the visit in advance. 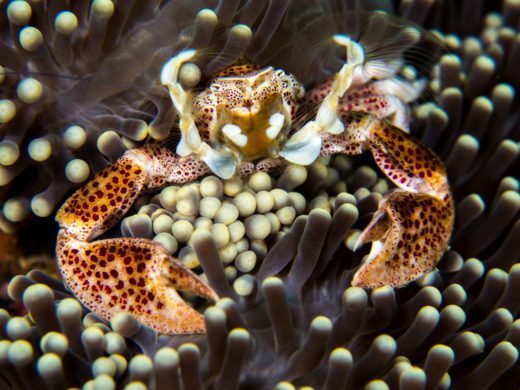 Sel Pele is known as the capital of macro underwater photography within the archipelago of Raja Ampat. This bay is inhabited by a large number of unique species, and in rather large concentrations; so if you dive in Sel Pele, you will probably find all sorts of corals, fish and marine mammals native to Raja Ampat. The best dive site, specifically, is on the outside of the southern side of Sel Pele Bay. On it stands a large vertical Wall, covered with beautiful soft and hard corals, and surrounded by sponges, sea urchins, mime octopus and mantis shrimp. This is one of the largest islands in the archipelago, and on it you will find some of the most distinctive coral reefs in Raja Ampat. These coral reefs form a kaleidoscope of stunning colors, making it stand out from other dive sites in the area. The sloping walls of the diving zone in Misool are inhabited by soft coral of every imaginable color, along with other marine species like Harlequin shrimp and pygmy sea horses. This dive site in Raja Ampat takes its name from the cross marking the landing site of the first Christian missionaries, who shipwrecked in the waters of Raja Ampat. A cross buried some 18 meters in the sand marks the place where the shipwreck happened, and it’s fascinating to see it surrounded by corals and sea life. The Japanese vessel that carried the Christians is the most accesible shipwreck in Raja Ampat, and in the course of the dive you can see some lamps from the ship and even enter the Operations Room and the pantry. In Cross Wreck the coverture of corals is very good and, especially at night, you can watch Napoleon fish (or parrotfish) or the lionfish. Another shipwreck that you can see in Raja Ampat is of this man-of-war from the Second World War. Inside the two holes made by the cannons, you can find all sorts of technical equipment scattered by the bombardments. Though it has less coral coverage than Cross Wreck, this shipwreck is home to a multitude of sea needlefish. From the surface you can see two large rocks that shelter a rich submarine flora and fauna just waiting to be discovered! 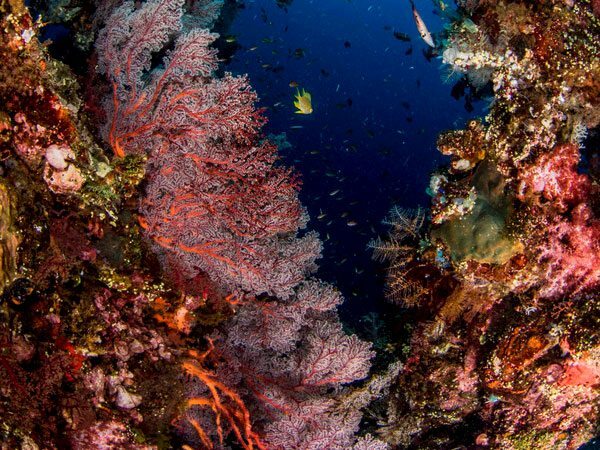 The first dive spot on Boo Island is accessed along a wall that confirms why diving in Raja Ampat is so marvelous! Soft coral, barrel sponges and other species of coral come together to form a colorful blanket against the ocean wall. At this dive spot in Raja Ampat, you can see numerous species of extraordinarily colored nudibranchs or sea slugs, like the black-rayed Phyllidia, with its bright yellow spots; the pink and yellow elegant Phyllidia; and the blue and black Chromodoris willani. This is one of the dive spots in Raja Ampat with the best visibility for diving. Its incredibly deep and crystal-clear waters let you discover a multitude of marine species. With a depth of around 40 meters, Fabiacet is an ideal place for taking wide-angle photographs. One of the species that you will see most frequently at this immersion point in Raja Ampat is the hammerhead shark, since the water is significantly deeper than at other points. At the same time, on the shallower outside wallks, the maroon-, beige- and cream-colored corals, along with the sponges, share this area with green tortoises, so you can enjoy a leisurely dive with total visibility. if you still do not read enough about our dive sites and what you will experience here, feel free to visit our Blog. Here we have more about Raja Ampat dive sites, the best activities in Raja Ampat and much more.